Nintendo is bringing a host of first- and third-party digital games, including some from acclaimed indie developers, to the Nintendo eShop on Wii U and Nintendo 3DS in 2015. In addition to anticipated upcoming games like Affordable Space Adventures, Runbow and Swords & Soldiers II, the newly announced Don’t Starve: Giant Edition and Never Alone games will be coming to the Wii U console with exclusive GamePad features and functionality. For Nintendo 3DS, puzzle platformer BOXBOY! 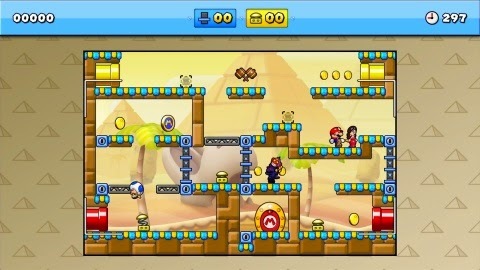 is set to arrive this spring, and Mario vs. Donkey Kong: Tipping Stars launches for Wii U and Nintendo 3DS on March 5. BOXBOY! for Nintendo 3DS lets players solve puzzles and traverse tricky landscapes by creating structures out of boxes across 173 stages as Qbby, the game’s angular main character. Developed by HAL Laboratory, Inc., the game is headed to the Nintendo eShop this spring. Don’t Starve: Giant Edition is an uncompromising wilderness survival game full of science and magic from Klei Entertainment. In this definitive version of the game, which launches this spring, the Wii U GamePad controller can be used for Off-TV play and an easy-to-access in-game map, a much-requested fan feature. Created by E-Line Media in partnership with the Alaska Native community, Never Alone is an atmospheric puzzle platformer that explores the harsh and vibrant world of Alaska through the traditional stories of the Iñupiat people of the Arctic. The Wii U version of the game launches this June and features Off-TV play and “contextual insights” – detail about the history, culture and lives of the Iñupiat people – that uses the second-screen interface of the GamePad. “The Nintendo eShop continues to grow, offering consumers a vibrant and constantly expanding library of digital content on Wii U and Nintendo 3DS,” said Steve Singer, vice president of Licensing at Nintendo of America. “We’ve seen tremendous support from the ‘Nindie’ developer community, and can’t wait for fans to get their hands on the games we will soon be helping them to launch.” In addition to these two game announcements, more levels, game play and characters were revealed for upcoming Nintendo eShop exclusive games like Affordable Space Adventures, Runbow and Swords & Soldiers II. Affordable Space Adventures, a development collaboration between KnapNok Games and Nifflas, is a beautiful space exploration game for Wii U featuring multiple levels that can be cooperatively played with up to three people in a seamless drop in/drop out mode. The game launches exclusively in the Nintendo eShop on Wii U on April 9. In Runbow, up to nine players can compete in fast-paced challenges featuring platforms and obstacles that appear and disappear as the background changes colors. This chaotically fun party game features catchy music, striking character and environmental art and hectic combat mechanics. 13AM Games also introduced a new female character, Val, and teased more playable characters to join the roster. Runbow launches exclusively in the Nintendo eShop on Wii U in Q3 2015. Like its predecessor, Swords & Soldiers II from Romino Games is a 2D side-scrolling strategy game for Wii U that allows players to acquire units, cast spells and build structures to overwhelm or outsmart opponents. In this sequel, players can play as three factions – The Viking Legion, the Demon Horde and the new Army of the Persian Empire. This new playable faction consists of mystic swordsmen, shadowy assassins and evil witches. Swords & Soldiers II launches exclusively in the Nintendo eShop on Wii U in May. Now there's the list of great games coming out. What game are you looking forward to?